Irreverent, funny, but sometimes accurate observations of fellow salmon fishers by someone with a finely tuned eye! 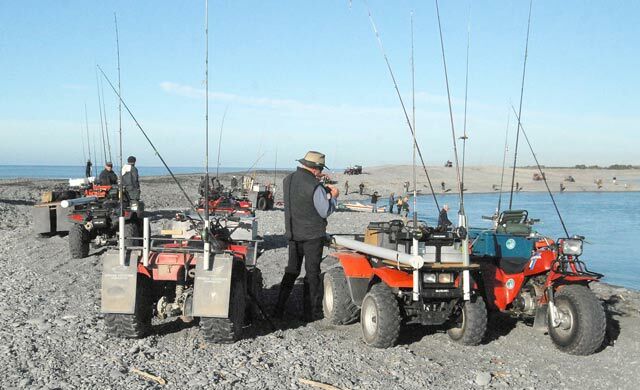 Salmon Fishers at the Rakaia River. There can be long periods between fish. 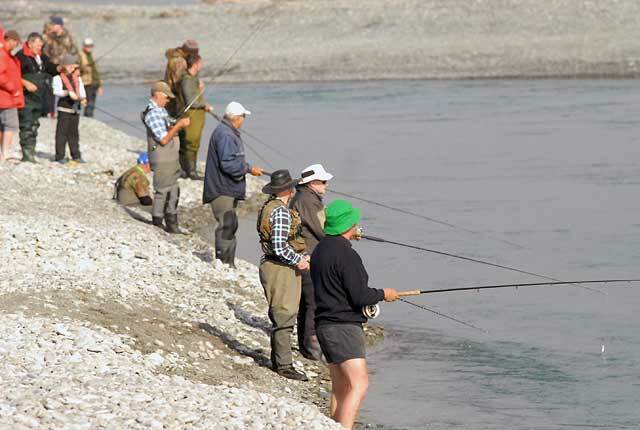 Since indulging myself in semi-retirement and taking up salmon fishing three years ago, I have been constantly surprised by the number of people who manage to be fishing when the initiated would confidently expect the workforce of New Zealand to be hard at it. A few seasons of observation have led me to draw some conclusions about the nature of the people‘ who are clearly addicted to salmon-fishing. And as my own addiction has developed into a serious inability to do anything else constructive between about December and the end of April, I’ve noted some characteristic sub-groups. 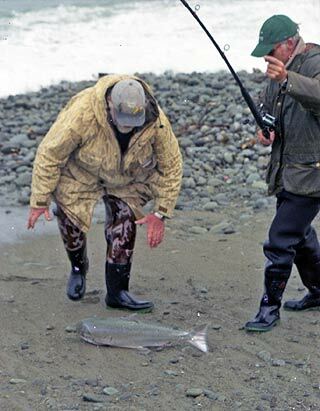 NZ Salmon Anglers Assn on FB. 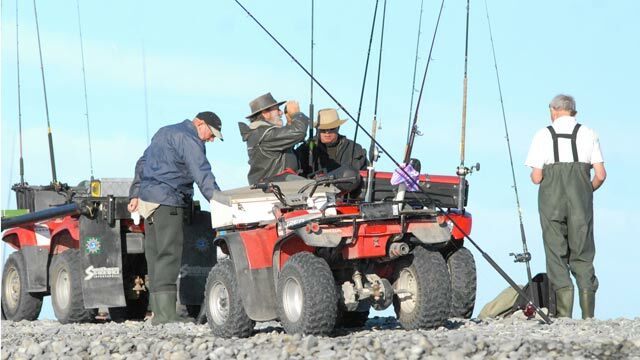 Salmon Fishers at the Rakaia River. He has the latest model top of the range 4WD, a jet boat, and never fewer than seven rods. He is highly efficient in his application to the task. He’s not there just to kill time, but to use it, and is often checking out the office on his cellphone. Salmon fishers at the Rangitata River. He usually looks like Buster Keaton and is a hero in his own eyes. Dapper, and brimming with information. He can tell you exactly where the salmon were moving last week, when he caught twelve, and exactly what gear they took in the surf at the Hurunui River in January. He has seen at least fifty fish going up the rapid in front of the hole where you’ve been fishing unsuccessfully for the last two hours. On his last three outings, he caught his bag on the first two casts. If you’re using weight, he tells you to take it off – if you’re not, to put it on (etc). She only wants enough for a feed. She’s been sitting in the car for years or doing the bottling, but when Dad died she had all this old gear lying around, and she likes to get out and see all the old codgers, and the youngsters she watched growing up. She has an earthy sense of humour and a fund of stories and reassures you that you have every right to be standing there in the line. Great fun, a real communicator, and very canny. Caught 169 last season, some of them legally hooked. He doesn’t care if he fishes the river out, or what method lands the fish. He tries to work by himself and unobserved, if he can, and has been known to throw something resembling a ship’s anchor into a gut, ignoring the need for a ﬂy. His life is getting more difficult and frustrating as pairs of rangers with cellphones and binoculars focus on his nefarious activities. He’s been a salmon fisherman for years, maybe centuries, and knows all the other old codgers. He’s a do-it-yourselfer whose 4-wheel bike features many clever devices even down to a tea-making facility. Old codgers don’t sleep much and are usually first at the river. They always seem to know if it’s worth having your gear in the water, so they spend a lot of the time away from Grandma reminiscing about past salmon seasons and sitting watching the novices expose their ineptitude. 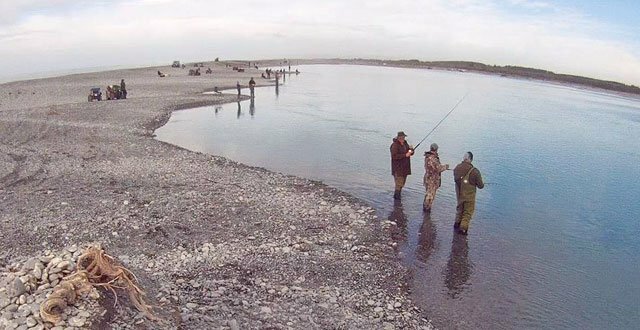 Salmon fishers casting at the wide Waitaki River gut. He is an excellent provider for hotel and restaurant menus. Forget the stories about the unemployed being layabouts – this one is out of bed before the crack of dawn and has his bag by the time you’ve arrived. He has plenty of time to drop off three to “The Grand”, and then whip into the office to collect his benefit and cast not a cursory glance at the Sits. Vac. before he’s off home for a beer and a snooze in front of Sky TV. He usually spends the off-season pig-hunting. There are a surprising number of these around. They have been fishing since Adam was a cowboy, and are philosophical in adversity, generous with information, and reassuring about your feeble efforts. The professional is a conservationist at heart, and often releases the first of the season to propitiate the gods. He is unfailingly courteous, tactful and tolerant, quiet, modest, unassuming and terrifically good at it. Young, blond, easily confused at first with a surfie. He arrives in a hotted-up ute with fats, radio blaring, blats up the shingle to the mouth, cheerfully leaps out in frayed denim and T-shirt, has seventeen casts before he decides to give it a miss, and disappears again in a cloud of dust. He doesn’t stay long enough to be a serious pest. Fortunately a member of a very small sub-group. He arrives at the gut after you, but it’s, of course, the fault of ”the bloody woman on the other side” (The Novice) when your gear tangles. Even though you’re with an Old Codger, a Sportsman, or a Professional he can still turn a beautiful day sour as he glares across the water at you. He’s an ugly customer, devoid of humour or charity, a real blot on the riverscape, and sometimes he’s also a Predator, who is hoping by these tactics to get rid of the lot of you so he can have a free hand with his bag of dirty tricks. She has taken on the men at their own game. She has all the gear — latest rods, designer waders, shades and hat – in case she is patronisingly mistaken for a hanger-on like this Novice. Of cropped hair and fierce expression, she and her friend take up their stance in the picket fence with grim determination. Very focused and uncommunicative, they scare the hell out of the Novice, and probably everyone else except the Predator. He regards all day visitors and campers with extreme suspicion. He does not speak to these people, and definitely not to strange women. He avoids eye contact, hoping to freeze the atmosphere so much you’ll go away and hopefully never come back – after all, these are his fish. Always next to the one who lands the fish. He is an indefatigable watcher of weather and tide and sponges up every available hint from The Professional, but he never catches a fish because he doesn’t believe he could get that lucky. He loves fishing, spends all his spare time thinking, dreaming and admiring fish, and preparing and sorting tackle: a boon to the local sporting goods retailer. Usually in the wrong place at the wrong time (“you should have been here on ……..”), and often annoying. For novices like me, there is enough leisure time, at last, to head for the hills and the beaches, and the bank balance is just healthy enough to cope with the huge outlay of capital per fish taken. The Novice only sees salmon from the top of a cliff or when landed by the Professional but gets a great kick out of following these glorious fish on their voyage from the seas to the mountains. Still, all those professionals must have been novices at some stage. Please note this article is intended as a bit of fun. The photographs that accompany the article are for illustration purposes only. No inference with the text is intended or should be assumed. 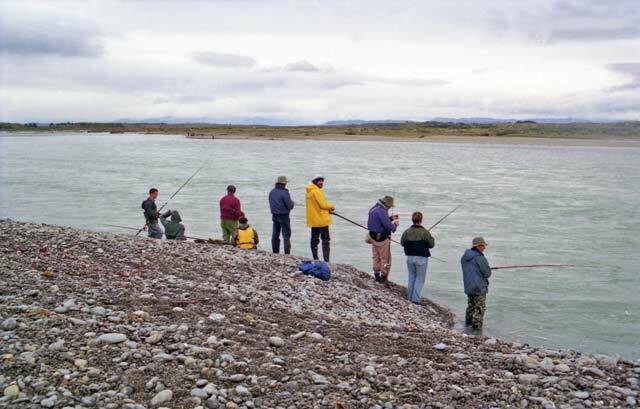 Salmon fishers fishing the main flow in the lower Rakaia River.